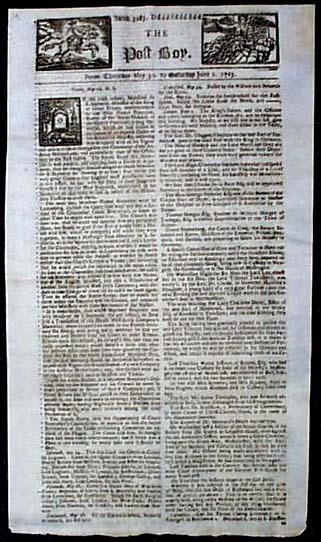 Item # 120160 THE POST-BOY, London, 1723-1726 A very nice single sheet newspaper featuring two handsome engravings in the masthead (see). Various news from Great Britain and the continent of Europe, plus a partial red tax stamp on the reverse. Measures about 14 1/4 by 8 1/8 inches, nice condition and great for display.